Simon Cowell Talks to EclipseMagazine! F’ing Simon Cowell!! On How The X Factor Is Different – And The Songs He Never Wants to Hear Again! Last week, Simon Cowell took a half an hour out of his hectic schedule to talk about his new singing competition series, The X-Factor [premiering on FOX, Wednesday, at 8/7C]. He was charming, funny and – in true Simon fashion – refreshingly blunt. I know that I’ve seen on Twitter and stuff that some former American Idol contestants have auditioned for the show, and my thought is, my question is how do you think of that, is that something you’d consider having people who have been on other reality shows on the show? And will we have any people like funny people, like the Jedward’s and Wagner’s, on this season of the U.S. version? Simon Cowell: Yes. I mean I’m glad you asked that, and I think it comes back to our point about having as few rules as possible; I mean that was the whole idea in the show in the first place. And we did expect some people who we’ve seen before on Idol to come along, so I didn’t really have a problem with that. None of them did particularly well. It was quite nice to hear them a second time. And with regards, for people who don’t know who Wagner is or Jedward, they were what I consider kind of joke contestants who got through to the final of the X Factor in the U.K. because one particular judge liked them. It comes down to the individual judge’s decisions, because in the later stages of the show you make decisions who’s going to make the finals depending on what category you’re given. And already there have been one or two questionable decisions by a couple of the judges, but that’s down to them. Hey, wondering do you think American Idol is going to finally win the reality competition program Emmy this Sunday; I know this isn’t an X Factor question. And why if you think it will and why not if you think it won’t? And if it does would you find it any way ironic and/or threatening? Cowell: Well I find it very amusing that after all these years that the year I wasn’t on it it would win the Emmy, and I think that would make me laugh so it probably will. With regard to threatening, no, I don’t see it as threatening; I think it would be more ironic. But I think I’m going to say if it does win this year it’s for all the years we did before, so whatever happens I’m going to claim the victory, I promise you, and replicate the Emmy and just put my name on it. I just wondered if you could tease us with some of the standout contestants so far; has anyone really, really impressed you? 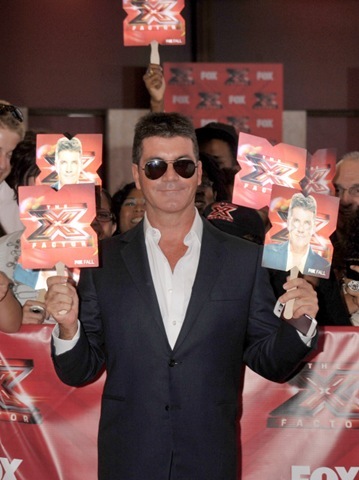 Cowell: All the interesting ones—I won’t say all the interesting ones, we have promoed a few. We’ve held back a lot for the first show and what we’re going to show tomorrow night in terms of what I would call different types of contestants to what you’ve seen before; very, very different backstories, the kind of stories I don’t think other shows would put on but we are. And I think you’ll hopefully enjoy it as much as I enjoyed making it when you watch it back. It’s quite edgy, it’s very raw, it’s real life, but it’s a talent show, so the ones we thought were talented we put on the show, but they are different to what you’ve seen before. How are you feeling at this point; are you excited, scared – what are you thinking? Cowell: Do you know I’m feeling excited now. I mean there are always nerves before a launch, but it’s good nerves. We always do this every time we make a show; we will edit the show, guaranteed, finish editing it hours before transmission because we’ll be making changes. But my friends and the people who have seen the show they’ve got excited about it, and I’m hoping that obviously America feels the same way, too. But no, I’m really starting to have a good time now. And I’m looking forward to tomorrow, because I’ve always wanted to do this, which is to have kind of like a, not a film premier, a TV premier in a cinema. It’s brilliant. I wanted to know a lot of times on singing competitions like Idol and The Voice we’ve seen people get really excited about sort of radical reinventions of songs, like Adam Lambert doing “Ring of Fire” with guitar or Kris Allen reinventing “Heartless”. Are you going to be pushing contestants to do that? Cowell: Who was the last guy you mentioned? Kris Allen reinventing “Heartless” or Adam Lambert doing “Ring of Fire” on guitar. Are you going to push contestants out of their comfort zones, are you going to push them to be radically rearranging songs, or are you thinking more straightforward interpretations? Cowell: Oh 100% we want as many unique versions as possible, otherwise you just turn it into a karaoke competition. So within about three weeks into the show you’re going to start hearing contestants way outside their comfort zone and hearing versions of songs you haven’t heard before. Part of the reason for doing that, as I said, is that you don’t want it to be like a bad sound alike, and secondly we’re going to sell downloads on iTunes so you have to come up with unique versions. And that’s part of the test of the contestants within the show, who can come up with the most unique version of the song; otherwise it’s just boring. You’ve been doing this challenge show so long, you’ve heard so many of the same songs over and over again, are there certain songs that you outright banned from the competition that you just said no way, I don’t want to ever hear that song again? Cowell: Yes. “I Believe I Could Fly” is pretty high up there. “At Last,” I think I’m now allergic to that song, and everybody seems to think “Unchained Melody” is my favorite song of all time. I think somebody said that as a joke, because it’s not, and I can’t hear that anymore. And Jason Mraz, that hit he had a few years ago, I cannot listen to that anymore, I mean as soon as they start– Oh, and I’ll tell you one, “Ordinary People” by John Legend. Cowell: Yes, because they always try and sing it like that version and it’s never as good, and I have to stop it now after about five seconds. Oh sure, yes, if you want to list a few more feel free. I wanted to ask you about I guess potentially with the … plan … with Paula; was it … that old feeling again or is there anything different or new that you …? Cowell: Well what was interesting is that Paula can be a bit wacky at times, but Nicole actually wasn’t far behind in a fantastically self-centered way, which she wasn’t aware of, which I found really amusing. There was another part of the auditions where every city we went to, and again Nicole wasn’t aware of this, she changed her accent; when she was in New York she had this kind of Brooklyn thing going on and then when she went to Dallas she became this southern belle. I mean she just changes every city you go into. And with Paula the great thing about working with her is within about five minutes of filming she’s not aware that the cameras are on anymore and she’ll fight with you over something, over something sometimes important, often not. And that’s what I like about her; she is prepared to argue. So it’s like getting an old dog back from the rescue pound; it’s kind of grateful to see you and the relationship is back in tact. If I were to ask you what it would take to make The X Factor work I’m sure you would tell me a great amount of talent and good singing. But since this is a television program and we’re here to entertain people as well how important are the backstories that the contestants are going to share to the success of making this a successful television show? Cowell: Personally I think they’re crucial, because I get to meet the contestants for the first time when they audition and we have no background information on them at all, which I don’t want to know. And if they’re interesting to me when I’m asking them questions then I think they’re going to be interesting to people who watch the show. Normally when I ask them what’s the most interesting thing that’s happened in your life and they start droning on about singing at the age of three or four I’m honestly not interested. I expect all of them to say that they wanted to be a singer; that’s obvious. I really am interested in their backstories; if they got divorced why did they get divorced, if they’re married are they happy being married, if they’ve left college how do their parents feel about them leaving college to pursue a music career. So really obviously number one on the list is talent, but number two is you really, really have to be an interesting person and have a very good backstory. I was wondering that now that you have Paula back if you had any interest in bringing Randy Jackson in for a little bit of an American Idol original line up reunion? Cowell: Well I miss Randy, because he really is a good friend. Maybe we’ll just get him a couple of front row seats every week and he can just do his dog-barking thing. No, but seriously though, I really do miss him, but he’s happy on Idol. I think L.A., who we brought in, has been genuinely a revelation, because he’s one of the most competitive people I’ve ever worked with in my life, so it was a different challenge for me. So I’m going to miss Randy as a person, but we hang out all the time. I’m probably going to meet up with him this week for dinner, so it’s all good. Simon, what do you think it will be like for the American public and what will make them connect with this show? Cowell: Well I think it goes back to the point someone made earlier on about the backstories: how interesting are the contestants, can you be bothered to invest time in them, are they good, is it different from what you’ve heard before. And I was very aware of that when we made the show because of the obvious comparisons to other shows out there, and I always said to people I think when you watch the show you’re going to understand that there’s more than a subtle difference between the two. So it’s a combination of it has to be raw, you have to allow the viewers to see things they haven’t seen before, you have to like or hate the contestants, and they have to be brilliant every week. And if you don’t have any of that people will switch off–I would switch off if it didn’t have that. I was wondering how, just from like a production standpoint, how is doing the American version of the show been different so far from your stance doing the British version? Cowell: Well it’s a good question, because when we first did this it was kind of weird for me because we do these auditions in front of crowds 4,000 people, 5,000 people, 6,000 people in arenas, and of course nobody had seen the show before. And in a strange way it made it more interesting, because the audience didn’t know what to expect. I could feel that they were kind of excited and a bit edgy, and then they got it quite quickly. I would say the American audiences are more vocal, that when they like someone they let you know, and they certainly let you know when they disagree with you. There were a few occasions where we had to, otherwise I think I may have got seriously injured, bring back some contestants we said no to because the audience wanted them through, because we did say to them you’re sort of like the fifth judge here. So it was fun and everywhere we went the crowds were good. Better in the evenings, because you could feel a lot of them were drunk so they were louder, and I like that. I might do that for the live shows, just make everybody drink before they come in. Can you tell me what is the most important thing that you’ve learned during your time as a judge on American Idol that you’ve now been applying for launching The X Factor …? Cowell: Well you have to say what you think, basically, otherwise anyone could do this job; I mean everyone has an opinion, you like somebody, you don’t like somebody. Not many people are prepared to actually say I think what other people are thinking at home, and I genuinely don’t have a problem with that. And the more time I spent in America the best compliment you could have is when people come up to you and say, “You do say what I’m thinking.” So I felt comfortable doing that when I moved from Idol onto The X Factor. It doesn’t always make you comfortable when you watch it back, but it definitely makes the show more honest I think. One of the things that was going to be unique, at least I think to American audience, was the mentoring process and now there’s some of The Voice jumped in and did something similar to that. Cowell: Well they didn’t do it as well as us, if I’m being honest with you, and you will genuinely see the difference, I think, on this show. I kind of expected them to do something like that, but that’s the nature of the game when you make reality shows. But it is a necessary part of the format that you really do mentor these contestants. And look, it’s not just what you do during the show; anyone can mentor. The point is can you mentor someone through the show and actually create a star. So you’re going to have to judge X Factor on what we do compared to what they did on The Voice. As I’m talking to you, this week an artist I mentored on X Factor last year in the U.K., they didn’t win, they came third, but they’re going to have the biggest selling single this year and the biggest selling album; they’re a band called One Direction. So that’s what I call proper mentoring where you’re preparing somebody for the real world. How early will the mentoring start? Cowell: It starts the second you’re given your category, when you find out who you have; you have the young guys, you have the young girls, you have the over 30 year olds, and you have the groups, and depending on what category you have you work with them all the way through until the end of the show. Cheryl Cole was shown briefly at the judge’s table in the trailer. I’m just wondering how you’re going to handle that situation; is she going to be edited out completely, is it going to be addressed at all? Cowell: No. No. She’s in episode one. She’s in the first hour. So in terms of how we address it I think we just pretty much tell it as it was; she was on the show and then she got replaced by Nicole. So on the first half of the show… it’s Cheryl and then the second half it’s Nicole. Hello? So I know you’ve mentioned several times about hating shows and things that are predictable. In what ways will The X Factor be unpredictable? Cowell: Gosh, well it’s just the fact, I suppose, that when you make a reality show good things happen and bad things happen. I think one of the things we showed in that eight-minute promo was me having a sort of a childish meltdown because I hated what everybody was doing on this particular day. But we do actually show the process, but it’s not always happy, sunny days when you make these shows, that things go wrong, bad things happen backstage, people have major tantrums, including the judges and the contestants, they go mad at you and that you have to show all that. You have to show the good, the bad, and the ugly. Can you talk about some of the challenges you had to overcome in bringing the show to America in order to make it work effectively as compared to Britain? Cowell: Well I think the first challenge was, if I’m being honest with you, I think the network initially would have been happier that we all stayed on Idol for the rest of our lives and there wouldn’t be another show. The problem with that was is that the show was becoming more and more popular around the world and inevitably somebody would have come along and done something really, really close to this show. And once we explained this to Fox they accepted the fact that it’s going to have to go on the air. And I mean they didn’t have to be sort of dragged and screaming to it in the end, but these are expensive shows to produce but because we had a really good couple of years the last two years in the U.K. I think it sort of speeded the process up and then they got really into it. And then the other challenges, of course, are trying to make your mind up who should be judging it, who should be hosting it; lots of things went wrong along the way. And that goes back to the previous caller, bad things happen when you make reality shows and it does become very public, but you just have to deal with it. You had a childish meltdown really, Simon? How did that go? Cowell: Well it was during one of the boot camp shows, and I think we had about a hundred contestants, like a hundred and ten or something, and they had an overnight challenge with a list of songs to just literally on piano or guitar do a kind of a stripped down version. And for some reason a load of programmers were brought in that night, and they all started coming up with weird what they thought were creative versions of these songs. I mean they sounded absolutely dreadful and were getting worse and worse and worse, and everybody sounded rubbish and we had a live audience in and they knew it was rubbish. It was just one of those very, very uncomfortable days. And the whole thing was filmed, and then the producers thought it would be amusing to include it in the show. And I actually, when I watched it back, although it was a bit embarrassing I thought yes, why not keep it in. Cowell: Crying, no. But there was a lot of crying. I think the following day it was like I remember thinking it’s kind of 11/3 Nicole/Paula on the crying stakes; Paula was quite a long ways behind Nicole amazingly, and then literally on the final two days called it all back and then they’re even stevens. Given the current climate of the music industry and the fact that there are so many talent shows on TV now do you think a show like The X Factor can produce like a megastar, like a Lady Gaga or a Justin Bieber, right out of the gate? Cowell: A hundred percent yes. And like I was saying earlier on, what I’ve seen with the show in the last couple of years in the U.K. with the kind of artists we’ve attracted the artists coming through are not just competing, they are murdering the opposition in the U.K. at the moment. And we hope to do the same thing with the show here; that was always the sole reason for making a show like this, can you find a different kind of artist who doesn’t just work within a competition show, because we’re always going to have a winner, but actually can compete with the big artists out there around the world. And that’s what you hope is going to happen, and I will die trying until the end to do that. Moderator: I believe we have time for one last question. That is from the line of Rachel Stein, and Ms. Stein if you can state your organization and then your question. Cowell: All right, last question; this has got to be a really, really good one. I think it’s pretty good. It’s actually touching upon a couple of the other things, Simon. We’ve seen on some of the other reality talent competitions that the winning contestant doesn’t always go on to have the most successful music career and sometimes, say in the case of Rubin Stoddard and Clay Aiken, like the runner up is actually way more successful. Why do you think that is? Cowell: Well I think it goes back partly to what we were talking about earlier on about the mentoring process, and it was a huge reason why in the U.K. I left Idol and started X Factor, because I used to get frustrated that we as people who work in the music business weren’t allowed to do anything with the contestants on a week-by-week basis and they would make these awful decisions. And I do think that if you have the right artist and they have the right person working with them you can start to demonstrate on the show each week the kind of record you’d be releasing after you hopefully won the competition. And that’s why I think some of these contestants haven’t done well, because they win because of popularity, not because of having a unique talent they’ve demonstrated on a week-by-week basis. And that’s why you have to update the process; you have to do something different and you have to take risks. So we’ll wait and see and see what happens. That’s wonderful. We look forward to it. Cowell: Yes. Thank you very much indeed, and thank you everybody for taking the time to be on the call today. Previous PostSix Reasons & Too Short drop “Raindance” videoNext PostPoppy Montgomery is Unforgettable!